Dr. Kelly Starrett dishes out the scoop on what it means and the origin of the metaphor. According to Kelly, he’s always been fascinated with the idea of the leopard: powerful, fast, adaptable, stealthy … badass. The concept of “fast as a leopard” stuck with him from a pep talk in the movie Gallipoli. It wasn’t until a Navy SEAL friend said to him, “You know Kelly, a leopard never stretches.” That’s when the idea of becoming a supple leopard crept into his mind. If you think about it, a leopard doesn’t have to prepare to be at peak readiness. It’s always read to attack, defend, run or hunt. There’s no warm up for the leopard. No form rolling or walking on a treadmill to get the body ready for exercise. A leopard naturally is always on. People aren’t on the same playing field as the leopard. We have to warm up prior to intense exercise in order to avoid injury and learn how to execute movements correctly. But as Kelly explains, that doesn’t mean we can’t work towards improving ourselves to full capacity and having the full range of proper motion to perform on cue any physical feat we desire. Leopards are naturally supple. Humans are not. Most of us over the years are tight, wrought with injury and soft tissue damage from years of bad habits, sitting, slumping while texting, and many other bad habits that over time, lead to tightness and a host of other mobility issues. We are missing key ranges of motion that prevent us from moving anywhere even close to the leopard. What is a Supple Leopard? Metaphorically speaking it’s the ability to move correctly in every situation. As humans, we need the tools to diagnose the problems and movements to correct the problem. 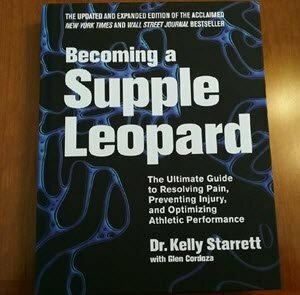 Becoming a supple leopard is exactly what Kelly Starrett teaches in the book thru a comprehensive system of movement and mobility. Now you know the meaning behind the phrase, what is a supple leopard which is easier to find that a supple leopard shirt!